Tampa gonzo-food emporium Datz has lassoed up a winner with its latest stunt burger. In anticipation of the new DC Comics flick out next month, it’s Wonder Woman–themed, though even a quick peep at the blue, red, gold, and starry creation should affirm that for you. 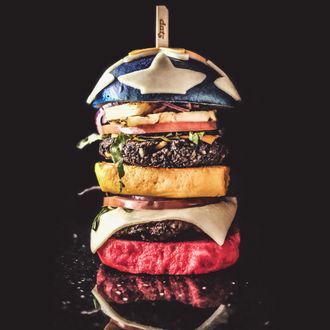 “We wanted something that would juxtapose the gritty-yet-modern warrior/athlete feeling of the new movie with the iconic, Lynda Carter–Wonder Woman TV version,” chef Joe Rivera tells Delish. Insane burgers are sort of the restaurant’s forte. Good Morning America once featured the Cheesy Todd, its sandwich with panko-breaded macaroni-and-cheese buns, and the joint also serves up a doughnut-bun burger to people who think their superpower is arterial invincibility. But this new thing modeled on Wonder Woman looks to tower more than half-a-foot tall and require a skewer to stay upright. The burger is more a throwback to the Lynda Carter era than a reconstruction of Gal Gadot’s new costume. The top bun is dyed shiny blue like the bottoms to Carter’s very ’70s super suit, and festooned with stars made from white cheese. Meanwhile, the middle bun is gold, and the bottom one is red — and in the middle are two patties, lettuce, tomato, red onions, and the world’s second-most-hated ingredient, pineapple.